A block wall is built one block at a time and it can be torn down the same way. The blocks are held together with mortar. Tearing down the wall involves breaking each block loose and then toppling it to the ground. If the blocks aren't going to be used again, then you can use a sledgehammer to do the majority of the work. Block walls usually have a concrete footing that also needs to be torn up. Put on safety goggles to protect your eyes from flying bits of block, mortar or concrete. Put on a hard hat to protect your head from falling debris. Wear work pants and a long-sleeve work shirt to protect arms and legs. Put on leather work gloves to protect your hands, and wear steel-toed boots to protect your feet from falling blocks. Grip the handle of the sledgehammer with two hands and swing the hammerhead up over your head. Strike the corner joints where the corners of four blocks come together on the upper two rows of blocks. Strike these joints all along the wall to break the blocks loose from the mortar. Push the loose blocks off the wall down the opposite side from where you're standing. Continue until the upper half of the wall has been toppled. Walk around to the other side of the wall where all the toppled blocks are lying. Pick each one up and move it from the area. Place a few in a wheelbarrow and wheel them away. The blocks can be stacked and stored or tossed in a trash receptacle. Bend your knees when lifting the blocks to avoid using your lower back too much. Topple the remainder of the blocks with the sledgehammer by swinging the hammerhead from the side instead of overhead. The bottom two rows can be struck by swing the hammerhead underhand. Remove all of these blocks from the work area. Dig out the dirt from around the concrete footing 12 inches out and as deep as the footing's base. Use a shovel to dig down and remove the dirt. Toss the dirt as far from the footing as possible. Walk to the end of the footing and slam the sledgehammer down on the footing about 8 inches in from the end. If the concrete breaks, then the sledgehammer can be used to break the remainder of the footing. Pull out each broken piece of concrete and remove it from the area. If the concrete won't break using the sledgehammer, use an electric jackhammer instead. Plug the jackhammer into a power outlet. Hold the jackhammer straight up and down 8 inches in from the end of the concrete footing. Spread your feet apart so they are in line with your shoulders and you feel like you have a solid stance. Put in a pair of earplugs. Grip both handles of the jackhammer and pull the trigger. Allow the jackhammer to work down through the concrete and pry as you go until the chunk breaks free. Set the jackhammer down on its side and remove the broken chunk of concrete. If there is wire holding the concrete in place then cut the wire with wire cutters. Jackhammer out all the concrete footing and remove the broken chunks from the area. The wall can be knocked down with a loader tractor or excavator if available. The footings can also be dug up with the loader bucket or excavator shovel if available. A pry bar can be used to pry blocks apart if necessary. or Hertz, if you're planning to do only a one-time job. 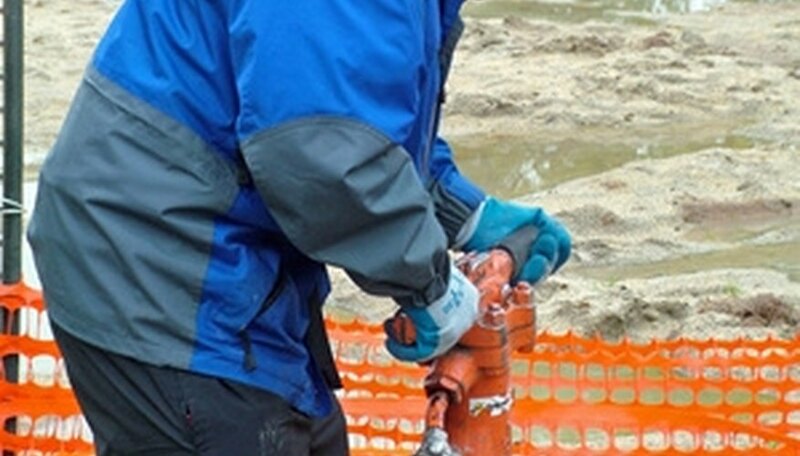 Keep the electrical cord of the jackhammer away from the tip of the jackhammer while in use. Keep the demolition area free of broken blocks, mortar and concrete to reduce the chance of tripping. 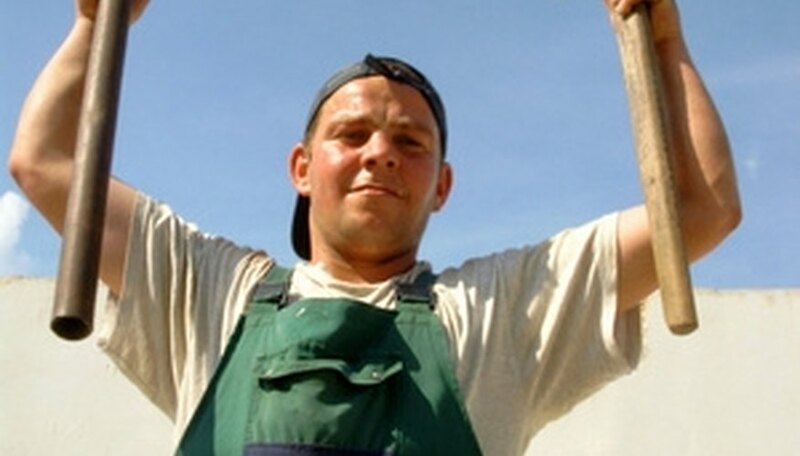 Failing to wear appropriate work clothing and safety gear may result in personal injury.